If you are tired of going through the hassle of washing your dog's bed it may be time to consider a waterproof dog bed or dog bed liner. Waterproof dog beds are perfect for outdoor use and, in addition to being easier to clean than plush beds, they can also help reduce problems with allergies. Try out a waterproof dog bed today and see how you like it. Unlike plush dog beds and blankets, waterproof dog beds and dog bed liners do not absorb water. If you have a dog who likes to jump right into bed after going for a swim or after coming home wet and muddy from his daily walk, a waterproof dog bed is just what you need. Waterproof dog beds and liners are designed to keep moisture from soaking into the bedding, thus keeping the bed itself dry and decreasing the frequency of necessary washing. Most waterproof dog beds can be wiped clean using a damp cloth - it is as easy as that! Waterproof dog beds are the perfect solution for outdoor dogs. Even if you provide your dog with a kennel or doghouse to sleep in outside he may still get wet if he chooses to go out in the rain. When your dog goes inside his kennel he deserves to have a warm, dry place to rest. A waterproof dog bed will remain dry even if your dog is wet - the water will slide right off the surface of the bed and soak into the ground rather than into the bedding. In addition to deflecting moisture, waterproof dog beds and liners may also help shut out dust and dander which could be a benefit if someone in your home has allergies. These dog beds also minimize odor because the possibility of mildew is greatly decreased and the bed itself does not absorb any of the water, dirt or dander your dog may come into contact with. A dog bed that becomes damp to the core is not only unpleasant, but can be dangerous too. 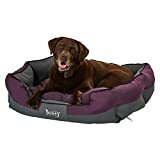 No matter what size or breed your dog is you can find the perfect waterproof dog bed for him online, like this great selection on Amazon, or in the shops. Waterproof dog beds come in a variety of shapes and sizes and many have added features and benefits like permeable membrane liners which help to repel odours. Some waterproof dog beds even offer orthopaedic support for old or arthritic dogs that sometimes have difficulty getting into or out of their beds. Another benefit of waterproof dog beds is that they can serve as an extra layer of protection if you have a dog that is prone to having accidents - the bed will not be ruined in the event of an 'wee-wee' accident and clean-up will be much easier than a standard dog bed. If you are looking for the perfect multi-purpose bed for your dog, consider investing in a waterproof dog bed. Not only will you find that these beds are convenient to use and easy to clean but your dog will love them as well.